CERIO’s OW-400 A3 eXtreme Power AC1300 Wave2 4X 11N/ac 2.4/5Ghz 2×2 External-ANT Outdoor Access Point is a dual band outdoor AP that combined superior functionality with an elegant and highly durable housing design. 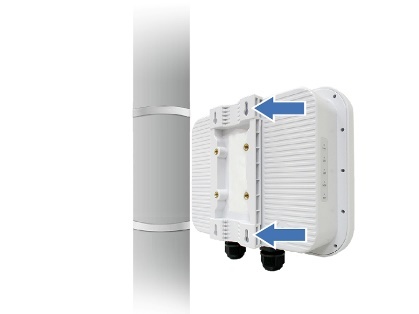 This 11ac outdoor concurrent dual band access point with latest MU-MIMO technology for improvements in the speed, reliability and quality of wireless communications, provides wireless 4 channel (4x speed) simultaneous operation in both 2.4GHz and 5GHz wireless coverage for maximum flexibility. It supports a maximum throughput of 1300Mbps, up to 400Mbps on the 2.4GHz frequency band and 867Mbps on the 5GHz frequency band. OW-400 A3 utilizes an 300mW high power design with four external N-Type antenna connectors. Two of the N-Type connectors are assigned to the 2.4GHz band and two are assigned to the 5GHz band. This device is powered through 802.3af/at Power over Ethernet, allowing both power and data to be provided through CAT5 cabling. OW-400 A3’s also supports fast wireless roaming 802.11r protocol for seamless roaming and smart client handoff. OW-400 A3’s high performance and IP68 weatherproof durable design are made to withstand harsh environment deployment. It’s perfect for deployment in enterprise, government, public environments, and WISP application. This provides product durability and user peace of mind when deploying wireless devices in outdoor environments. Users Upload/Download Bandwidth Control speed limits, and User Device (Total) bandwidth control. Administrators can regulate the 3limit of each network user. Supports Band steering technology which detects dual-band capable clients, and directs these clients to the less saturated 5GHz network. Supports intelligent auto channel scanning function, automatic scanning the most undisturbed and suitable wireless channel in the field environment, which is convenient and time-saving.